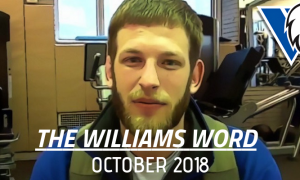 A little less than two years ago, we ran an article outlining all of the athletes who had committed to Williams Baptist University’s then-emerging Greco-Roman program. The list featured a dozen wrestlers, most of whom were holdovers from the school’s NAIA folkstyle team. There were a couple or so freshmen, to be sure, but that wasn’t the point. Despite the fact that the majority of athletes at the time were Greco neophytes, WBU setting sail with such a high number was seen as nothing short of astounding. And the craziest part is that the young man seen as perhaps its most talented representative hadn’t even arrived yet. Duncan Nelson (67 kg) was in-between when it came to his post-high school options during Williams’ formative months, and he originally considered continuing on in folkstyle. However, all it took was an appearance at the 2017 Fargo Nationals to ease him over the edge towards Greco. To say it didn’t take too long for him to catch on would be relatively inaccurate; after all, Williams Baptist’s inaugural year of competition didn’t really begin until late-March of last year at the Bill Farrell Memorial. Nelson, in his first Senior action of any kind, made an impression on many observers by roughhousing his way to bronze. A fourth-place finish at the Junior Nationals followed, which in turn qualified Nelson for the Junior Trials. But that would be it. For a while. A long while. Nelson had been competing with a torn ACL, MCL, and meniscus, the verifiable trifecta of knee ailments responsible for the lion’s share of most wrestling injuries. As such, Nelson was forced to shut it down and undergo surgery with the hope that he would eventually return to full capacity. That is where we are now. 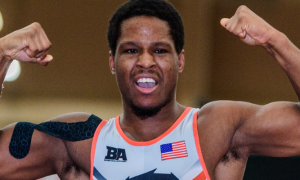 Nelson, now 20 and in his final year of Junior eligibility, is preparing to make a run at next week’s Junior World Team Trials in Las Vegas. Even with his time off the mat and extended break from competition, he is still pegged as a viable contender for the top spot. But for as important as that may appear to be in the moment, it’s not all he’s after. Nelson — who unapologetically, if not downright assertively, makes known both his short and long-term goals — wants World and Olympic medals. Now. As in, right away. It’s not that he expects it to be easy, or that he’s overconfident, overzealous, or just plainly unaware of what these grand achievements entail. It’s that Nelson believes to shoot for anything less is tantamount to self-treason. Wherever he winds up, the only thing anyone knows for sure is that the journey restarts next week. A lot of eyes will be fixed on Nelson, and rightfully so. It’s a good thing he has the attitude to match their intrigue. 5PM: Let’s start with the knee and where you’re at now. Are you 100% healthy going into Vegas next week and what was the exact nature of your injury to begin with? Duncan Nelson: Well, I haven’t been 100% healthy for a very long time (laughs). It all kind of started the summer before my freshman year (at Williams). I had a growth in my appendix, like three-and-a-half centimeters in diameter, something crazy. I had to get surgery on that in the beginning of the year. I came back, and the very next week I tore my ACL. That was in October, I think. I kept wrestling and I competed at the Bill Farrell and the Nationals. Then right before I think the U23’s, I wound up tearing my meniscus and my MCL, as well. Because, my leg was already unstable. I talked with Coach (Jonathan) Drendel and we decided that I wasn’t going to wrestle and that I would go back and get surgery. I got the surgery and it took me about two months before I could even start to do anything on a mat again, which itself was probably a little early but I wanted to get back. But I’ve been pretty good for awhile now. They actually cleared me two days after Schultz, so I was kind of upset I missed that. But right now I’m 100%. 5PM: Did everything in your knee get repaired? DN: Yeah, they took a graft from my patellar tendon and put that in my ACL because it was completely torn. My MCL, they let that mostly heal back together but they had to shave some of it off, and then my meniscus they shaved like 30% of it off, I can’t remember. 5PM: Do you feel it now? Is it something that you notice? DN: Oh yeah, I feel it everyday (laughs). It hurts. But it’s not a bad pain, it’s more like a lingering thing. It doesn’t stop me from doing anything. 5PM: When it came to deciding where you were going to school, what was the decision-making process like and how did you end up at Williams? DN: I took sixth in the state my senior year and I didn’t know I was, you know, like that good. I actually had committed to Elmhurst College back home in Illinois. It’s a Division III school. 5PM: That’s where Joe Rau went. DN: Yes, exactly. But then I started doing really well at all these tournaments. I won the Central Regional and then I went down to the Southeast Regional. I was pretty much destroying everybody. 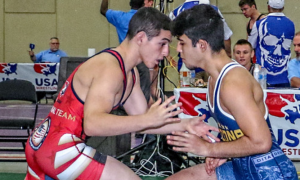 I wrestled Anthony Artalona, who was ranked first in the country, and I kind of beat him handily. So I was like, Dang, I’m good at Greco! Then I got put on the Junior Duals team and did really well there. Bryan Medlin kept telling me that I should go to Williams and wrestle Greco because I’m way better at Greco than I am at folkstyle. I wasn’t sure. I was kind of hesitant. You know how stupid high school boys can be. 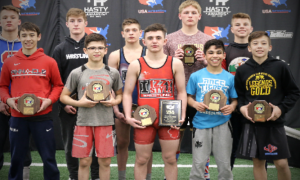 But at Fargo I didn’t do as well as I should have, or at least not as well as Medlin or Coach Mike Powell from Oak Park thought I should have done. 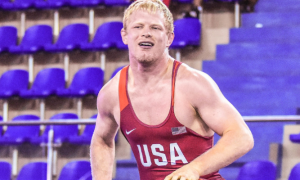 I went into Fargo my senior year thinking that I was going to obliterate my way through it, but that didn’t happen — although I still All-American’ed. So I decided, Yeah, I’m better at Greco so I’ll go to Williams and make something of that. 5PM: Who talked to you from Williams, was it Kerry (Regner) or Coach (Jonathan) Drendel? Duncan Nelson: I met both of them at the same time. Coach Medlin has a camp in Washington, Illinois every year and they were both over there. And I’ll never forget what he (Medlin) said, because people don’t compliment me too much and this stuck out, but he pulled both of them over to meet me and he called me a “diamond in the rough”. I was like, That’s so cool. I talked to both of them and they told me to come visit. When I went on my visit I originally decided, This would be cool and all, but I think I’m going to keep wrestling folkstyle. It wasn’t until after Fargo when I finally said, That’s stupid, I have to wrestle Greco, I’m a lot better at it. 5PM: The Illinois age-group system is the best in the country and to deny that is to deny reality. In your view, what is it about Medlin and Powell that seems to resonate with kids, when it comes to this style especially? DN: That’s a really hard question. I guess aside from the fact that they are technically amazing coaches and know so much of what they’re talking about — which I think is a good 40% of it — another thing is that they’ve built this culture around wrestling where it’s a lot more serious than other states take it. It’s almost like you’re not just wrestling for yourself, you’re wrestling for the state of Illinois, and you’re wrestling for something bigger than just yourself. Even now, I find so much pride in being from the state of Illinois and being able to represent it. When I see all of the kids I wrestled with throughout high school doing well — like Austin O’Connor for example and I wasn’t close with Austin but I wrestled him a couple of times in practice — I feel so much pride that kids from Illinois are doing so well at the collegiate level. I think that it’s just the culture they brought us up in, to have pride in where we come from and to wrestle for something bigger than yourself. 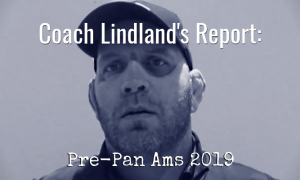 5PM: Last year was interesting, it was Williams’ first year and the first major event was the Farrell, and right away you medaled by taking third. Did that do a lot for your confidence given that you didn’t have any real Senior matches before then? DN: No. To be honest, I couldn’t have cared any less, I was just really upset that I didn’t win. I don’t know, the way I was raised is, you have to be confident anyway. Winning matches or having success doesn’t build up your confidence. Because, it doesn’t matter how confident you are at the end, what matters is if you win or not. That’s how I’ve always thought about it, it’s how my brother thinks about it, and it is what my dad tells us. I mean, it’s not just winning, it is also having fun and enjoying what you do. And that’s part of the reason why it isn’t a big confidence thing. I am going out there, I love wrestling and just having fun. I love winning and I’m trying to win. I obviously didn’t win that tournament. I got a bronze medal, or took third. It was just me having fun, I guess. That’s the best way to put it. 5PM: When you go to Las Vegas, are you focusing just on the Junior age division? DN: Yes. I would have liked to wrestle Seniors but my coach wants me to wrestle Juniors, and I get that. I think I can have a lot of success at Junior, although I think I can also have a lot of success at the Senior level. But yeah, I am just wrestling Juniors this year. 5PM: Does that mean you aren’t going to Akron for the U23 Trials? DN: No, I am going to Akron. I am going to wrestle Juniors and go\ to Akron. And hopefully, if I do well at Juniors I can go to the Senior Trials. I’d like to wrestle in as many things as possible because there’s no point in doing all of this training if you can’t do the fun part, which is competing. 5PM: That’s interesting to bring up because Williams has been forced to train a whole ton without much competition in the early stages. Is it tougher for you, mentally or otherwise, to have gone through so much downtime between events and been relegated to so much training? DN: Nah, that’s not tough. I love wrestling and I love training. I’ll use all of the opportunities I have to train as much as possible and wrestle as much as possible. If anything, it gets me excited for the next tournament. But no, it’s not hard. Some people, it really wears on them, all of the training without as many tournaments during the year. But for me, it’s just, it is what it is. I love wrestling and I love training. 5PM: How soon are you looking to go overseas, not counting if you make either the Junior or U23 Teams, or both? As soon as you possibly can? DN: Oh yeah, man, I want to go overseas. It would be really cool. Going overseas would be really cool, although, I don’t really care, either. It would just be really fun. I’m more worried about the basic stuff, the stuff everyone is worried about — the Open, the Trials, the Worlds. If you ask me what I want to compete in, that’s what I’m going to tell you. The other tournaments, like going overseas to some rinky-dink tournament in Spain or wherever, that’s fun, but I don’t particularly care. 5PM: Do you have parts of your training that you prefer or look forward to more than others? Duncan Nelson: That’s a hard question. I don’t particularly like working on one thing over another. I guess I prefer working on the stuff I need to work. Coach Drendel and I have a really, really good relationship and we often talk about the stuff I need to work on, and then he puts in a little extra work with me, just something here and something there. Basically, whatever he tells me to do I am going to do, and it’s the same with any coach I have faith in. If I have faith in the coach — and I have 100% faith in Coach Drendel that what he’s telling me to do is the right thing to do — then no matter what I feel like doing, I am going to do what he says. And usually, it’s not like I don’t feel like doing what he tells me. Because, getting good at wrestling is exciting, winning wrestling matches is exciting, and if that’s the outcome then I’m all for it. If you want to be successful you have to high goals, and my goals are very clear. I failed at my goals last year but they haven’t changed: win every single wrestling match I ever wrestle; make the Senior World Team this year; win a gold medal at the World Championships; and I want to win three Olympic medals over the next three quads. And I think if people don’t have goals like that, then I don’t know why they’re wrestling or doing what they’re doing. Follow Duncan Nelson on Instagram to keep up with his career and competitive schedule. Listen to “5PM22: Sammy Jones guest co-hosts as Five Point Move visits with Lucas Sheridan and Sam Hazewinkel” on Spreaker.